This genus is accepted, and its native range is Juan Fernández Islands. Perennial. Culms decumbent; 30-40 cm long. Ligule an eciliate membrane. Spikelets comprising 1 fertile florets; with diminished florets at the apex. Spikelets cuneate; laterally compressed; 9-12 mm long; breaking up at maturity; disarticulating below each fertile floret. Floret callus pubescent. Glumes persistent; shorter than spikelet, or reaching apex of florets; thinner than fertile lemma; gaping. Lower glume linear; 0.75 length of upper glume; herbaceous; 1-keeled; 3 -veined. Lower glume apex acuminate. 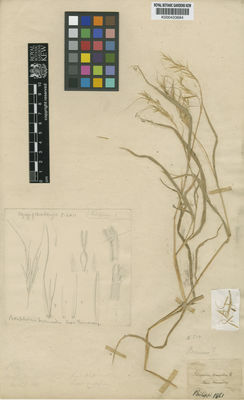 Upper glume linear; 0.75-1 length of adjacent fertile lemma; herbaceous; 1-keeled; 3-5 -veined. Upper glume apex acuminate. Fertile lemma lanceolate; subterete; coriaceous; without keel; 5 -veined. Lemma margins convolute; covering most of palea. Lemma apex acuminate; awned; 1 -awned. Principal lemma awn flexuous. Palea coriaceous. Apical sterile florets 1 in number; barren; rudimentary. Apical sterile lemmas awned.